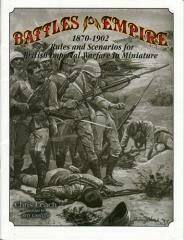 It is a complete rules system for recreating the battles of British imperial conquest in miniature. Players command units of British regulars and trained colonial recruits, or fight against these invaders with Dervishes, Zulus, Pathans, or Boers. - Rules are easily learned but tactically subtle. - No mandatory basing Scheme required. - Integrated movement and morale system makes ambitious plans difficult to coordinate under fire. - Quick play is facilitated by a concise turn sequence and efficient mechanics supplemented with specific rules to represent the fighting character of each army. - Includes optional rules for ambushes, commander heroics, and hidden deployment. 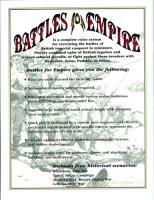 -Includes simple rules for gunboats, dhows, and attacking building and battlements. Ahmed Kheyl, Second Afghan War.